The big news, Early Game Access starts two days earlier!! That is right; Early Game Access will start on Dec. the 13th, instead of the 15th as originally planned. This is a welcomed announcement. I mean seriously, who doesn’t like getting that “Christmas or Holiday gift” early? Now there are possible issues on there being no grace period for those getting physical copies of the game, but for now let’s enjoy the good news…at least for a moment! So since we have the good news and it is around the Holiday season, I have another video from the folks at GameBreaker.tv to start us off with this week. Yes, the crazy and fun loving folks at Gamebreaker.tv have created a very unique take on an age-old Christmas carol…thrown in with some playful WoW vs. SWTOR banter. Yes, most of us cringe at hearing WoW mentioned, but it is what all MMOs want to be. Okay back to the part of enjoying this fun MMO Christmas carol. If you have made a funny SWTOR video while in Beta or another type of music video dealing with SWTOR please email me a link and I will try to get included in the upcoming HoloNet Link articles. CourtneyWoods News and Announcements -> Pre-load STAR WARS: The Old Republic Now! I wanted to let everyone know that we’re very aware of the interest in this feature. We’ve spoken with the development team and we’ll have further comment on it soon – before the 10th, we hope. Hello everyone let me try and clarify a few things here. First, the previous thread was closed because it dealt with the ‘cancellation glitch’. At over 1,400 replies it had drifted way off-topic from the original concerns, and by closing it, I left it with a definitive position on that topic. Second, regarding this thread, we have no insight into Walmart’s practices or statements they have made. In fact, we have little influence over a retailer beyond supplying them with product. While we will always attempt to investigate and help out if we see issues that seem to be affecting a lot of customers (like the previous ‘cancellation glitch’), that’s where our direct influence ends. Reading through this thread, the number people who have had their SWTOR order cancelled or refunded seems to be relatively low. If you feel your refund was given in error, you will have to initially take this up with Walmart directly. We cannot act on an individual’s behalf before they have dealt with the retailer. If you feel you still have a legitimate concern and you have not received help from the retailer, you can contact Customer Service with your issue. If we see a large scale problem occurring, we will investigate and take action where possible, but your first point of contact for retailer issues will always have to be that retailer. For the CRR family, listeners and followers this has been a bittersweet week. Our very own Kathy has moved on from the podcast and fansite. She has accepted a job with Bioware. We will miss Kathy greatly and wish her all the best! We will, however, try to steal her away at least to say hi. 🙂 Rest assured Corellian Run Radio will still keep moving forward as we approach launch and beyond! On that note, we want to welcome Deirdre to the site and podcast. She and Roxanne have already found areas that they agree to disagree lol. Also this week, we had Elearic, do an article. It has already sparked quite the discussion in the comment thread. Check it out and let us know your thoughts on Damage Meters. Theses links and links to the rest of our articles for the past week are listed below. We have mentioned a few gifts the past couple of weeks. Let’s talk about ornaments and small stocking stuffer items to give to that gamer friend or family member. 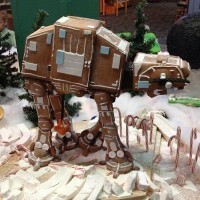 From cafrepress.com we have a Star Wars ornament that is perfect for that Darkside Force user on your gift list. 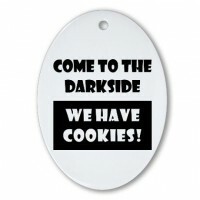 In fact, our very own Carla has made offers about those cookies offered by the Darkside. It is a nice gift that won’t set you back too much. They also offer the slogan in some of their other gift options. 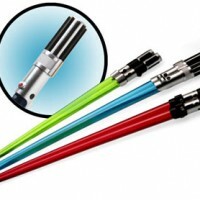 Okay and no, I am not getting a kick-back from ThinkGeek.com, but if they would like to I’m willing to discuss it lol. 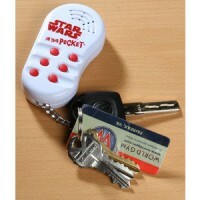 But I digress, another small stocking stuffer type gift, called Star Wars in Your Pocket. It is a small keychain that has six unique voices with various phrases. This is the perfect gift to give to grandkids, nieces and nephews, so they can keep sharing it with their parents. Heck, who am I kidding, I want one. 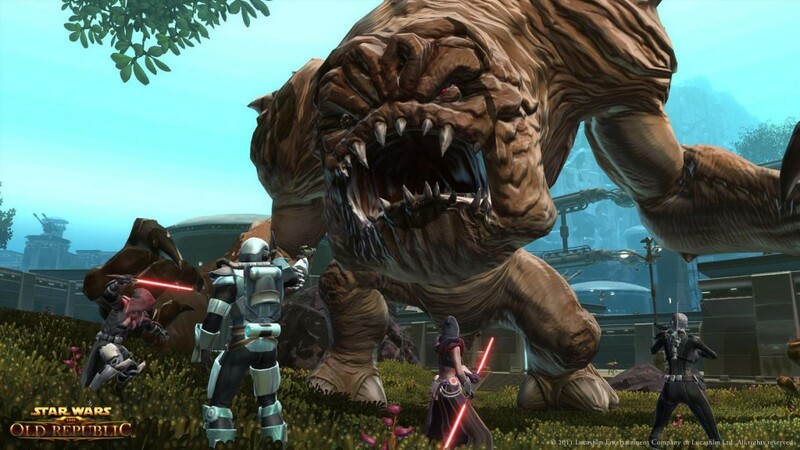 This week we get another beautiful image from the game…well if you consider an attacking Rancor beautiful. We see Imperials defending their position from the attacking Rancor on Belsavis. That’s all this week from the HoloNet Links. Are you ready for early game access and launch? Are you or your guilds planning any special SWTOR launch events? Let us know below in our comment section.